Fluid retention is always considered pathological. The excess of fluid may accumulate under the skin or it may accumulate inside the lungs and cause even more serious problems. Fluid retention develops due to an inadequate elimination of fluid from the body. It is medically known as edema. Fluid retention commonly affects pregnant women and is associated with certain medical conditions (heart conditions, kidney disorders, etc.). What are the Causes of Swollen Ankles Fluid Retention? Everyone has at least once experienced swollen ankles and fluid retention. There is a variety of conditions that cause swelling of the ankles and fluid retention. People who sit for long hours (particularly during long rides or flights) commonly suffer from swollen ankles. In this case the muscles that surround the lymphatic blood vessels of the legs do not contract and allow excessive filling of the blood vessels and extravasation of the excess of fluid. Similar effects occur in people who stand for a longer period of time. In women swelling of the ankles occurs during premenstrual syndrome. Furthermore, the condition is also frequent among pregnant women and it is most intensive during the second, especially the third trimester. And finally, women who are on birth control pill are at a higher risk for water retention. Fluid retention and swollen ankles are also typical for people suffering from varicose veins and may also affect patients who take certain medications that are able to withhold the water inside the body. Swollen ankles are only one feature of even more serious conditions including cardiomyopathy and other heart ailments, kidney disease, liver disease, rheumatoid arthritis etc. 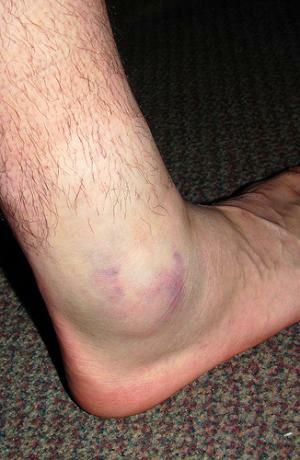 Furthermore, in people who have suffered injury of the ankles the injured area normally becomes edematous. People who tend to consume foods rich in sodium and those whose intake of sodium exceed recommended daily doses the risk for swelling of the ankles increases. And finally, swollen ankles typically affect people who are suffering from protein deficiency. In order to start with proper treatment for swollen ankles fluid retention it is essential to identify the underlying cause of fluid retention. In some cases setting of the diagnosis is easy while in others a person must undergo many tests and examinations until the actual cause of fluid retention is found. Pregnant women do not require any treatment at all. However, people suffering from heart disorders and illnesses of other organs require proper treatment which will provide with elimination of excess of fluid and prevent some potential complications. Fluid retention associated with intake of medications can be eliminated if the particular drug is replaced with a suitable substitute. People who spend many hours sitting or standing are due to occasionally interrupt these activates and stretch their legs. This may prevent fluid from accumulating. Is fluid retention linked to SLE? hydrochlorot 12.5mg for water retention???? ?